This entry was posted on February 1, 2012 and tagged amaranth, cosmos, flower, P. Allen Smith, seeds, tithonia, zinnias. Bookmark the permalink. The first year I started my garden there wasn’t much in the way of color. Most of my budget went to structural plants and soil prep. Being the visual and, ahem, somewhat impatient person that I am I wasn’t about to go all growing season without blooms. My solution was flowers that are easy to grow from seeds. 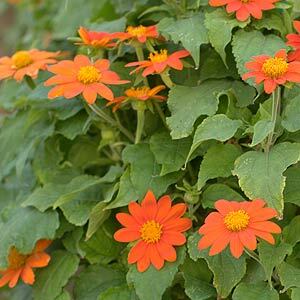 Here are five flowers that you can sow directly in the garden and expect blooms in the same growing season. Cosmos come in shades of pink, orange and white. Variety sizes range from 1 to 2 feet. They make good cut flowers if you cut them as soon as the blossoms open and put them in cool water, submerging as much of the stem as possible. After the last frost date sow seed in prepared garden soil in a spot that receives full sun. Space seeds 2- to 3-inches-apart and cover with ¼-inch of soil. When the seedlings are 2-inches-high thin them to 5-inches-apart. You can also start seeds indoors 6 weeks before last frost. 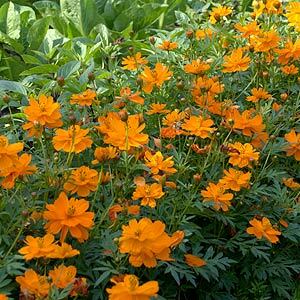 This is a wonderful plant for adding fragrance to the evening garden and it’s very easy to grow. Four O’Clocks are large and bushy. They will quickly fill a bare spot in full sun to partial shade. The plant also acts as a Japanese beetle trap. The beetles love to eat the foliage, which is toxic to them. It’s also harmful to gardeners as well so be aware of that. After all danger of frost, sow the seeds directly in the garden. They aren’t particular about the soil as long as it is loose and well draining. Cover seeds with ½-inch soil. When plants are 4-inches-tall, thin to 14-inches-apart. 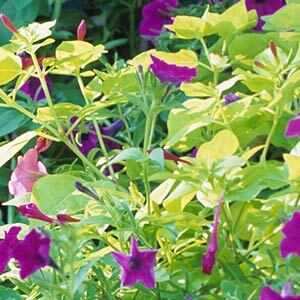 Four O’Clocks will readily self-sow so remove seed pods to prevent them from taking over. This old-fashioned annual is an everlasting indoors and in the garden. They are an excellent flower for drying to use in bouquets and wreaths. And, if you let the seed drop to the flower bed each fall you’ll be rewarded with volunteer plants in spring. If you grow globe amaranth, select tall varieties over the dwarf or “buddy” types, which aren’t nearly as interesting. Sow seeds in average, but well-draining soil in the spring after the last frost date in your area. Soak the seeds overnight to improve germination. Thin the seedlings when they are 2- to 3-inches-tall. 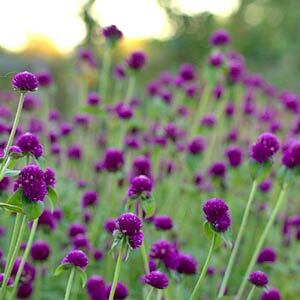 Globe amaranth is fairly drought tolerant but performs best when given a regular supply of water. This is a very dramatic plant that can grow to 6-feet-tall over the course of summer. The flowers are orange-red with a daisy form. It’s a favorite in the fall garden. Birds and butterflies love this plant. It’s beautiful paired with purple or pink. Sow the seeds in spring after the last frost date in prepared soil in full sun. Cover with ½-inch of soil. When plants are well-established thin them to 24-inches-apart. You can start the seeds indoors 5 weeks before the last frost date. Zinnias come in a rainbow of colors. Even green! All shapes and sizes too. They are a must have for cut flower bouquets. 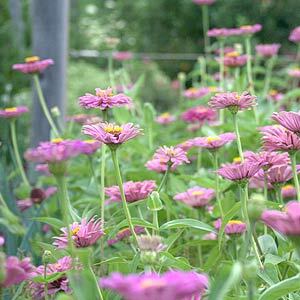 Zinnias will attract butterflies and beneficial insects to your garden. Once temperatures stay about 50°F, sow seeds in prepared garden soil in a spot with lots of sunshine. Cover the seeds with ¼-inch soil. When plants are 3-inches-high thin them to 8-inches-apart. For earlier bloom, start seeds indoors about 4 weeks before last frost. Five Great Flower Seeds | P. Allen Smith Garden Home.